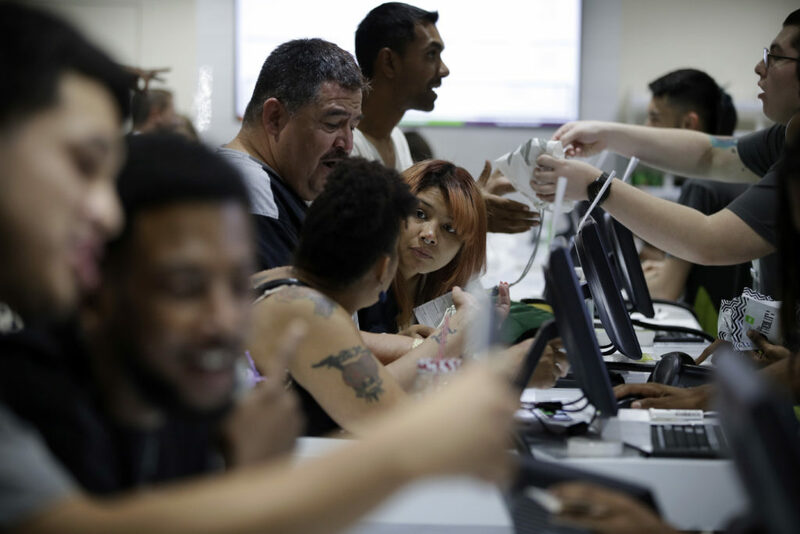 LAS VEGAS (AP) — Tourists and locals alike were among the more than 100 people waiting in line at one Las Vegas-area dispensary Saturday as Nevada became the latest state in the U.S. with stores selling marijuana for recreational purposes. Minnesota resident Edgar Rosas Lorenzo on Saturday flew with his family to Sin City for a wedding. 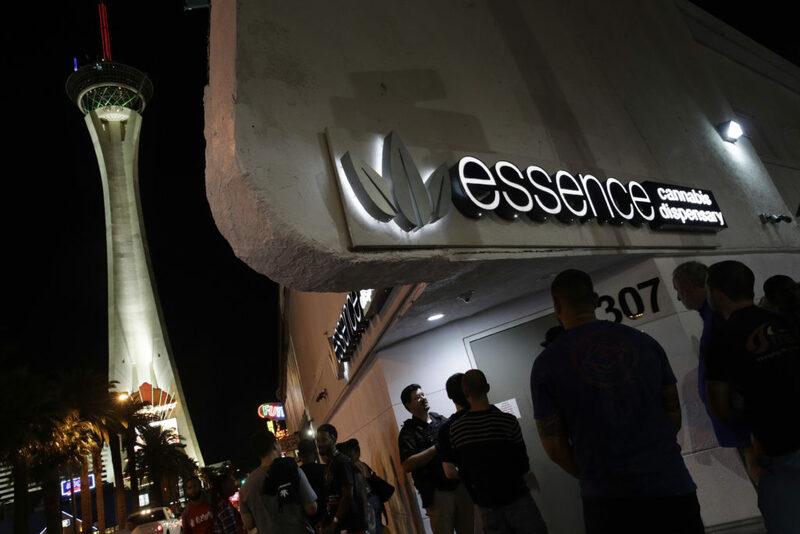 But even before he checked in to his hotel, he stopped at a dispensary on the Las Vegas Strip. 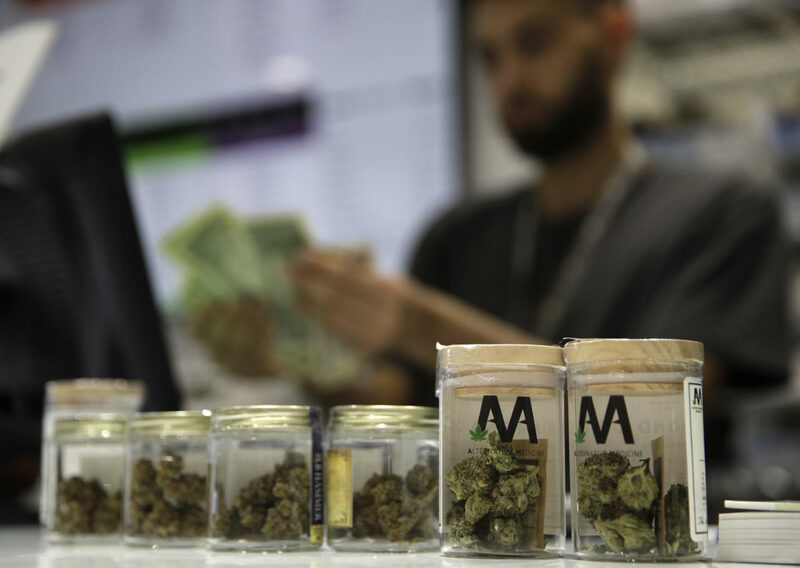 Lorenzo, 21, said he learned of the legalization of recreational marijuana in Nevada while he was at the airport waiting for his flight to depart. He drove with his sister and soon-to-be brother-in-law from the rental car facility in Las Vegas straight to the dispensary. They waited in line about 40 minutes before he could buy one-eighth of an ounce of marijuana and hemp wraps. 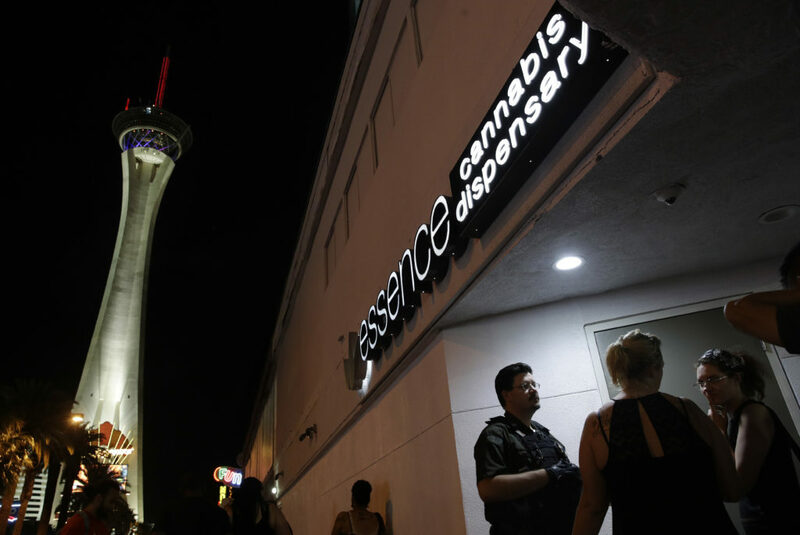 It remains illegal in Nevada to consume marijuana in public, including hotels. Violators face a $600 fine. 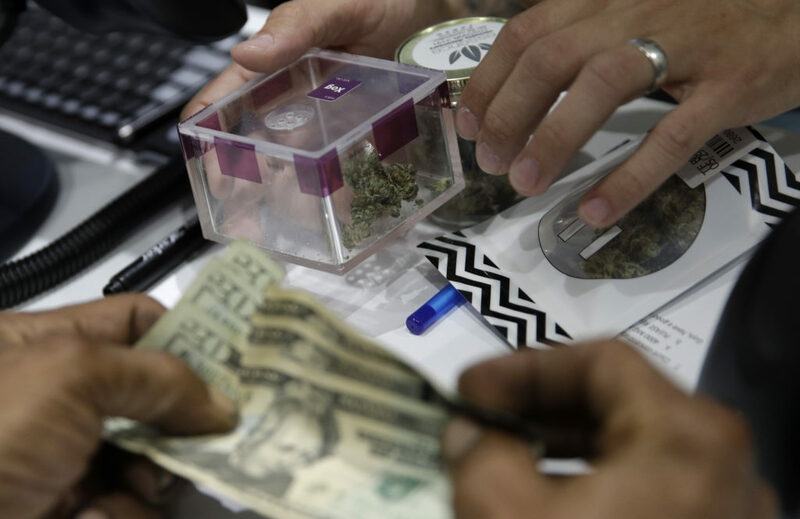 That’s one reason why some in the industry think edibles will be most popular with visitors, who can eat the goodies almost anywhere without attracting attention, including casino floors where cigarettes are allowed but pot-smoking is not. “I have yet to figure that out,” Lorenzo said of where he’ll smoke the weed he got at the Essence dispensary. Lorenzo immediately posted photos of his stash on Snapchat. His friends have said they’re jealous and asked where he bought the products, he said. Lorenzo said he will plan another trip to Vegas specifically to be able to legally purchase marijuana, not to visit the city’s world famous casinos. 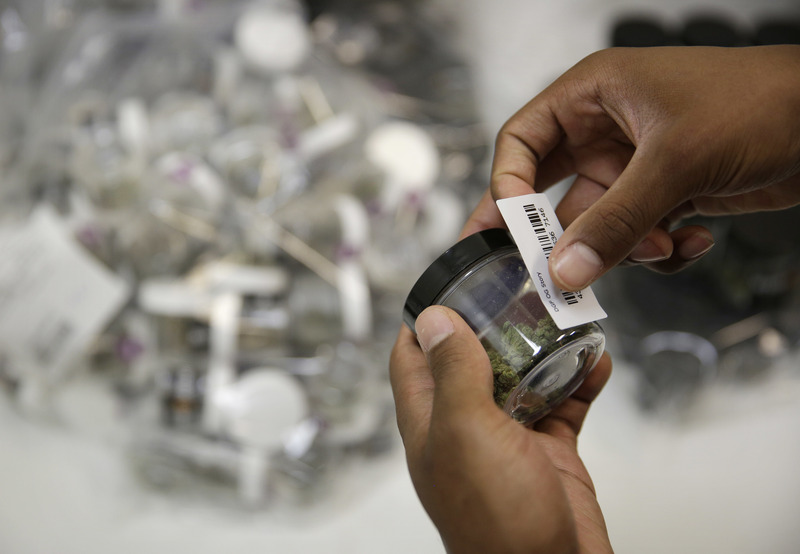 “We just got here … Instead of looking around in Vegas, I’m in a dispensary,” he said. Armen Yemenidjian, CEO of Essence Cannabis Dispensaries, called the day historic. “The prohibition of cannabis is ending slowly but surely, and, you know, we as Las Vegans are happy to be a part of it,” Yemenidjian said. 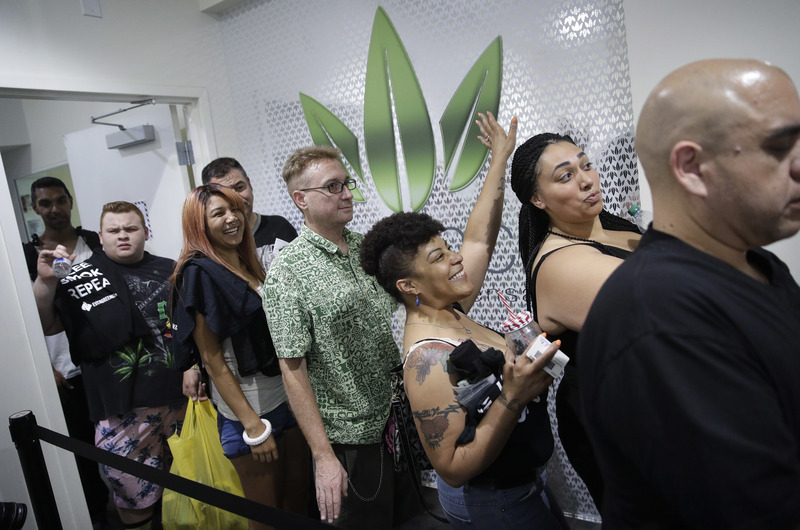 Meanwhile, Kristin Deneal got in line outside a pot shop at 5:45 a.m., after a different store that opened at midnight closed before she could make a purchase. She brought a folding chair and sat by the door, striking conversations with the security guard and others as the line continued to grow before doors opened at 9 a.m.
Deneal, a Las Vegas resident, said she is elated at being able to legally buy the drug that for decades she has had to buy through acquaintances. She said smoking marijuana helps her cope with health conditions while also working a stressful job at a bank. “It looks like they have enough stuff for everyone, it’s just a question of getting through the door,” she said. State Sen. 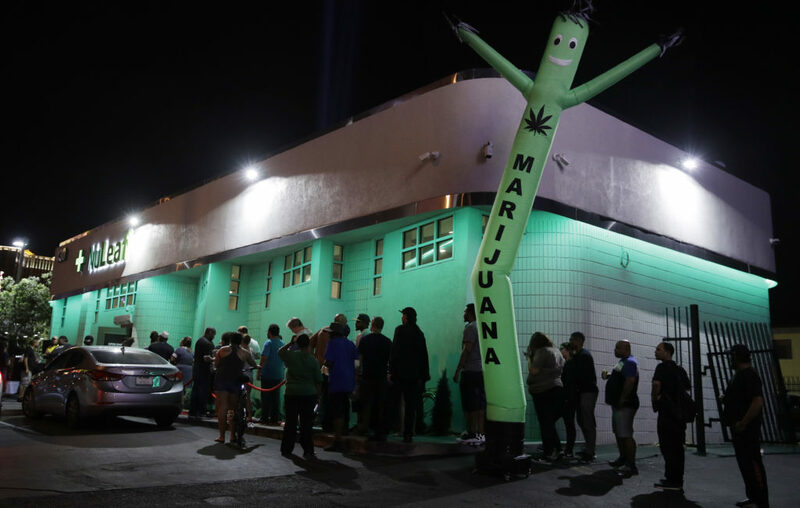 Tick Segerblom, one of the main proponents of marijuana legalization in Nevada, made the first purchase at The Source dispensary at a strip mall. Deneal and others followed. An hour after the door opened, at least 80 transactions had been recorded. Deneal, 57, said she has a bipolar disorder and a bad neck. She said she never got a medical card for fear of a federal crackdown on those who provided their information to obtain it. And now, she said, she no longer has to fear potentially being arrested for possessing marijuana. “I’m going to spend the whole $100 bucks,” she said. 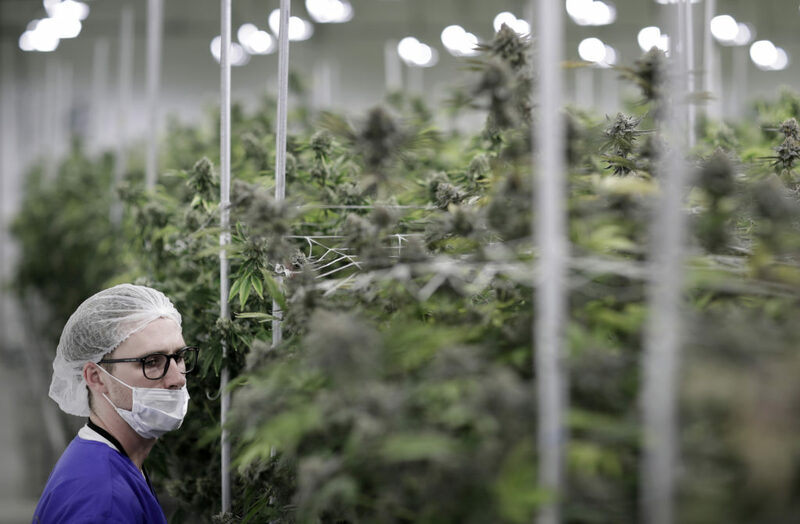 Recreational marijuana sales began shortly after midnight, just months after voters approved legalization in November, marking the fastest turnaround from the ballot box to retail sales in the country. Some facilities are in strip malls, while others, in stereotypical Las Vegas fashion, are in neighborhoods shared by strip clubs. 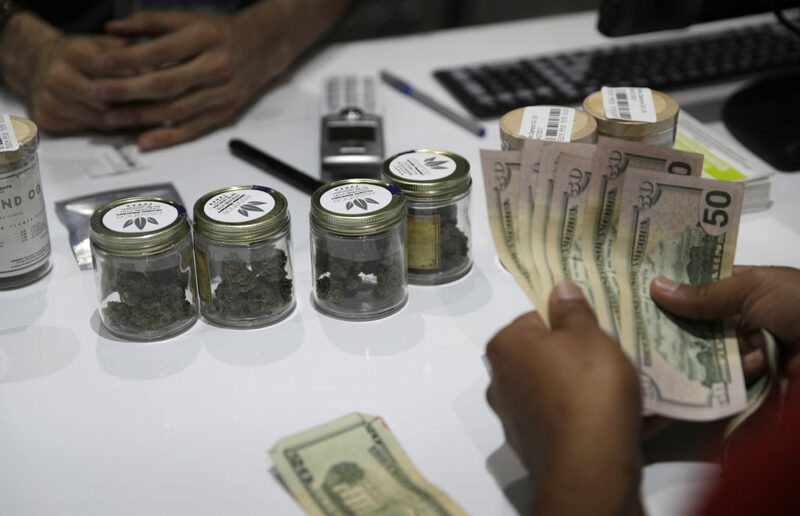 Some dispensaries have ATMs inside because they only accept cash transactions for marijuana. “I’ve been living in Vegas for 15 years and I keep missing the cities that legalize marijuana and edibles. So I’m happy that it’s here now,” said Babs Daitch, who was waiting in line. Written by REGINA GARCIA CANO and JOHN LOCHER, Associated Press. Associated Press writer Sally Ho contributed to this report. Every citizen of Utah should be really worried about this. Utah has led the nation for years as one of the highest abusers of prescription opioids in the US. If we let this “pot” into our state, we might lose what we have struggled so hard to build. 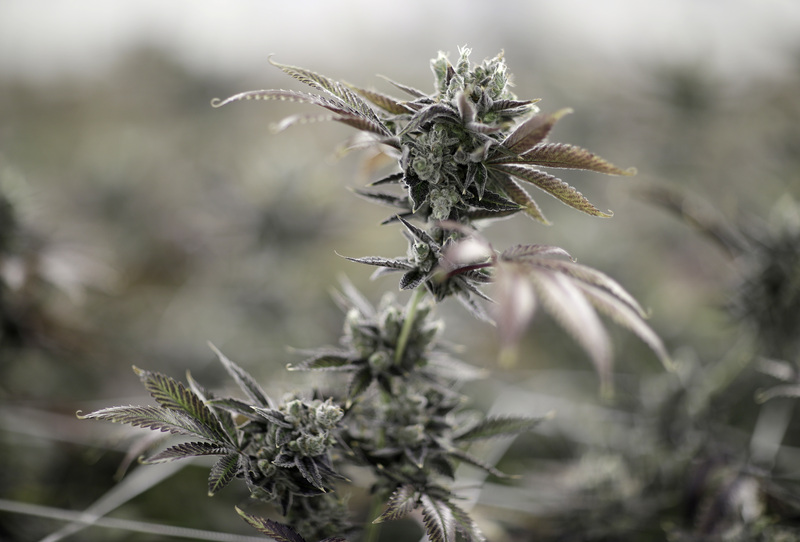 Pot already is in Utah, as is a lot of much nastier stuff like meth. See very recent news articles about major drug bust in Rio Grande neighborhood of Salt Lake City. Nearly every day report in St George newspaper of a bust of some kind right here in our little corner of Zion. The question isn’t whether we can keep it out — it’s what do we do about it? People! Please be careful when traveling to Mesquite to buy weed. Take hwy 91 down, and I-15 home! Park a block away from the dispensary etc. If you are a tattooed love-child driving a beater, and you’re going to be lit-up before the door hits you in the azz! Just don’t go! Send Grandma with specifics for the “Purple Kush Flake” you want, at $80 an Oz, and don’t forget to short her some cash that she will have to make up for out of her Social Security check. Be safe! People with addiction to pain medications are primary source of escalating drug use and addiction. Better marijuana for medical condition or and even getting high than opioids, meth, and heroin. Common sense. You Mormons are surrounded! They are to the left, they are to the right, this will keep you up all night! One of these days maybe these clowns will realize the stuff is nearly free when u grow it yourself. It’s about like growing a tomato plant. You don’t have to wait in line and pay huge prices, and these “dispensaries” will have to lower their prices or go out of business. My son has legally grown in two states; it ain’t nothing like growing ”tomatoes”. lol Equipment, proper lighting, you have to work diligently to keep insects and foreign growths off the plants. Otherwise you are growing nasty junk. 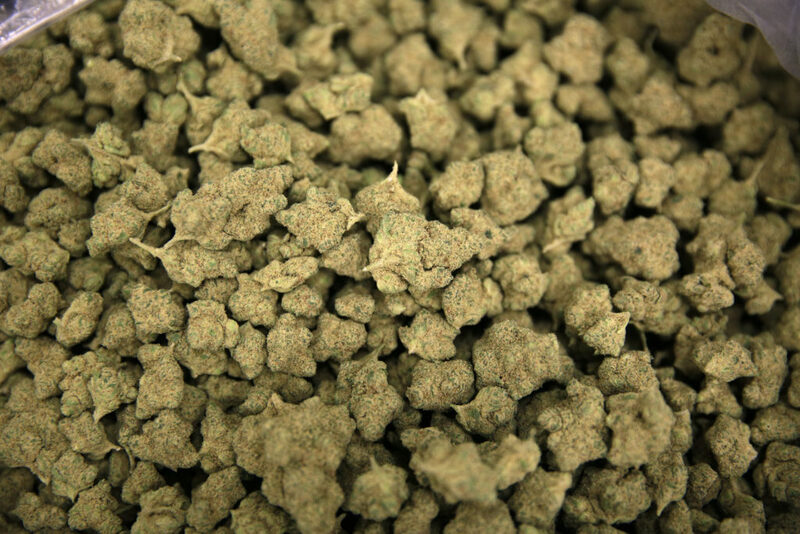 The prices will be determined by competition and availability, type of marijuana. Just like anywhere and most products sold directly to the public. The SL Tribune had a more extensive article focused on Mesquite, of all places, claiming a lot of UT license plates in the parking lot. 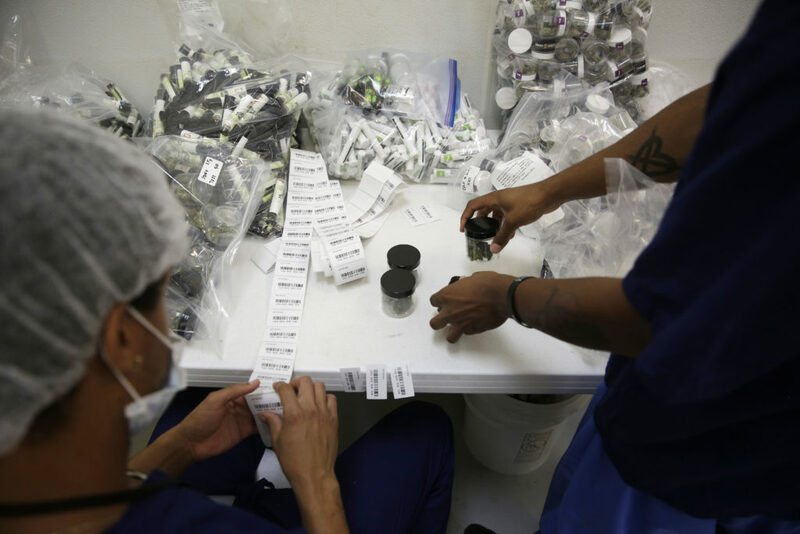 The posted prices, per ounce, are huge, and about the only benefit of buying it at a dispensary is the traceability of the product from grower to dispenser. All transactions are in cash, for now. An acquaintance in Alaska, with the help of a greenhouse (and artificial grow lights in gloomier weather) has built a modest little personal enterprise that he uses to barter for other commodities in his tightknit community. As pointed out above, only modest gardening skills are necessary and much information can be found on You Tube. The legislation in NV and CO seem to be more of a novelty, and a modest step towards decriminalization. The outstanding issue remains how to detect when a driver is impaired by using these products. Much science remains to be conducted to have something as repeatable as a breathalyzer for BAC measurement. Ugh! Thank you sir may I have another! Not to mention it sounds like entrapment because the federal government doesn’t recognize it. Also if you can’t pass a drug test say goodbye to your jobs. 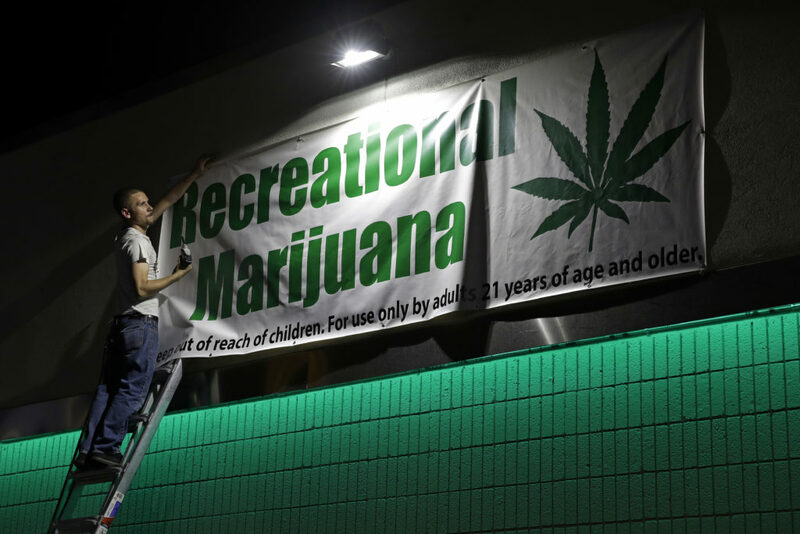 The Feds have been looking the other way in all the states that have legalized to date. Why go to Vegas when you can get it in Mesquite. People picking up booze at Lee’s, then weed at DRH. Driving through the Gorge might become even more of an adventure. Wait! They sell booze close to us to??? NOOO!!! Maybe you should have a sip, and get over youself Henry. I’m one of the ones making those trips to Lee’s. Do you have difficulties passing through doorways with such an inflated head, Real Life? Do you have problems with reading comprehension? I go to Lee’s; I haven’t gone (and don’t plan on going) to DRH. I hope that those that do go to both will take you advice, although it will be tempting to start nibbling on those laced brownies on the drive back. It’s already a hairy drive through the Gorge. Oh no!! The sky is falling, the sky is falling. I like the way you think little chicken!